Tired of the same old lunch each day? 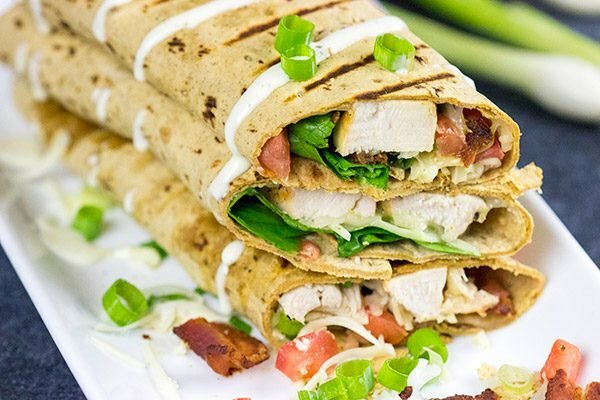 These Crispy Chicken Bacon Ranch Wraps will solve that problem! Did you guys see the news that Kermit the Frog was recently fired? Well, not Kermit. The voice of Kermit. Apparently there was a creative difference in opinion regarding the future of the Muppets. But that got me thinking. How exactly does one become a cartoon voice? At what point do you decide, hey, I’m going to be the voice of a cartoon character? Don’t get me wrong here. I think it’s awesome! I’ve just never thought about the career path for cartoon actors. Do you have to work your way up through the ranks? For instance, do you have to prove yourself as Rizzo the Rat and then the Swedish Chef before applying for the job as Kermit? Or do you just go straight the top when you realize you have the ability to speak like a cartoon frog? Speaking of jobs, I’m pretty certain Robbie will have a career in the music industry. Whenever we turn on music in the kitchen (which is quite often), he starts dancing and bopping and doing all sorts of creative, new moves. Heck, his dance moves put mine to shame…and I’ve got a good 35 years on him! His toy pianos are his current favorite toys, and he insists on playing both of them at the same time. These are little keyboard-style pianos, so he sits on the floor with a keyboard on each side. I’m not saying the music he produces is good, but it is music. And it sounds like a bit of a ruckus. The other day, I was in the kitchen listening to Robbie create “music” while making these Crispy Chicken Bacon Ranch Wraps. We’ve been on a wrap kick for the past week or so. 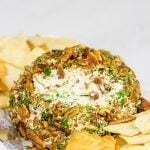 Wraps are so easy to make, and you can have fun with the filling. For us, we always start with Flatout flatbreads as our base. 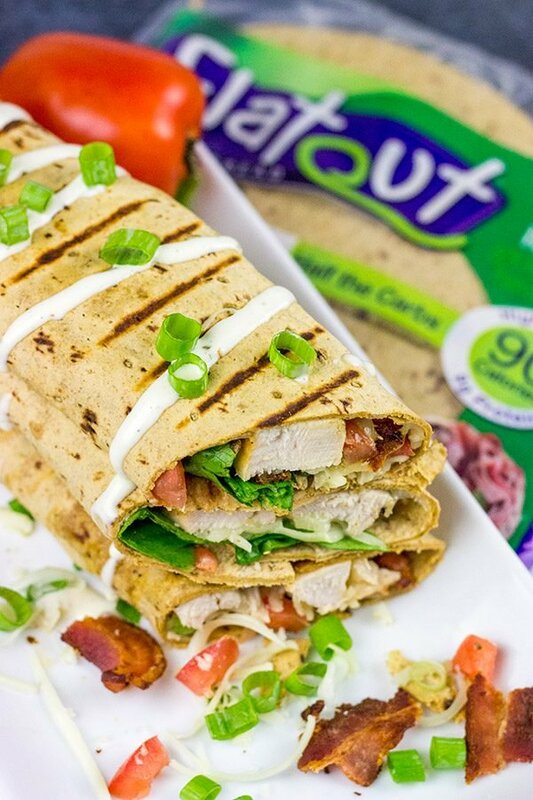 For these Chicken Bacon Ranch Wraps, we used Flatout’s Light Italian Herb wraps. These wraps are quite tasty, and each one is only 90 calories with 9g of protein. That’s a nice, easy way to keep lunches and dinners on the healthy side! 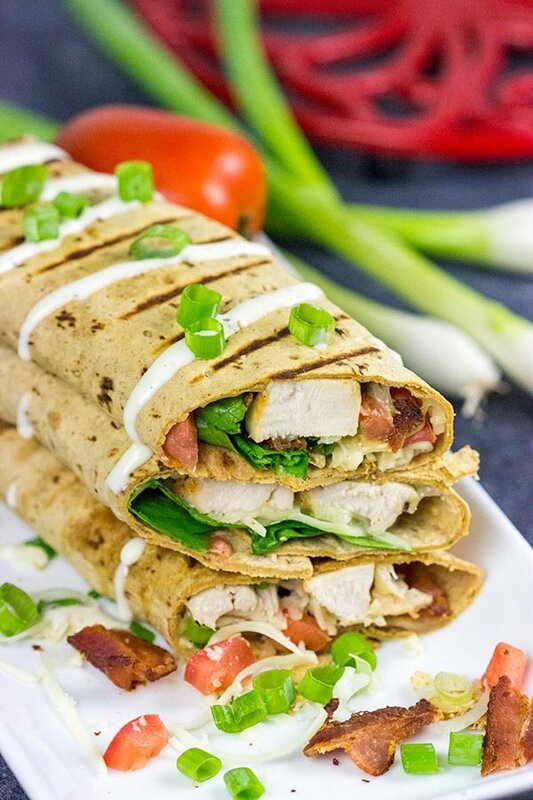 I grilled up a couple of chicken breasts and then layered these wraps with a bit of bacon, shredded cheese, lettuce, tomatoes and of course ranch dressing. And to mix things up a bit, I toasted these Crispy Chicken Bacon Ranch Wraps in a grill pan for a couple of minutes. The result was delicious! Think overstuffed quesadilla kinda delicious. We tried to get Robbie to nibble on a wrap, but he’s still being a pretty picky eater when it comes to anything other than fruit. That’s ok. He’ll come around. In the meantime, Laura and I chowed down on these wraps for lunch while Robbie entertained us with an original musical performance. Quick note: I brushed the chicken breasts with a bit of olive oil and then seasoned ’em with salt, pepper and dried oregano. But you could go any direction with the spices here. And if it happens to be cold outside, then you could skip the grill and just cook the chicken in a pan indoors. 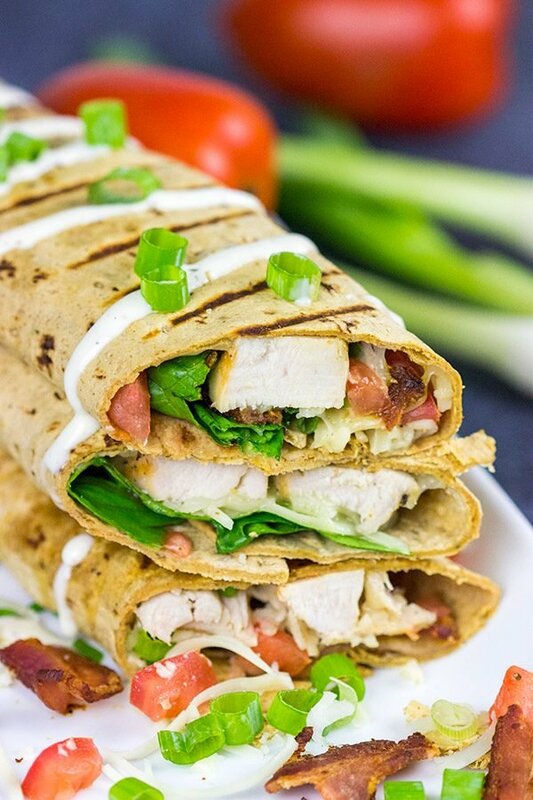 Want to recreate these Crispy Chicken Bacon Ranch Wraps? 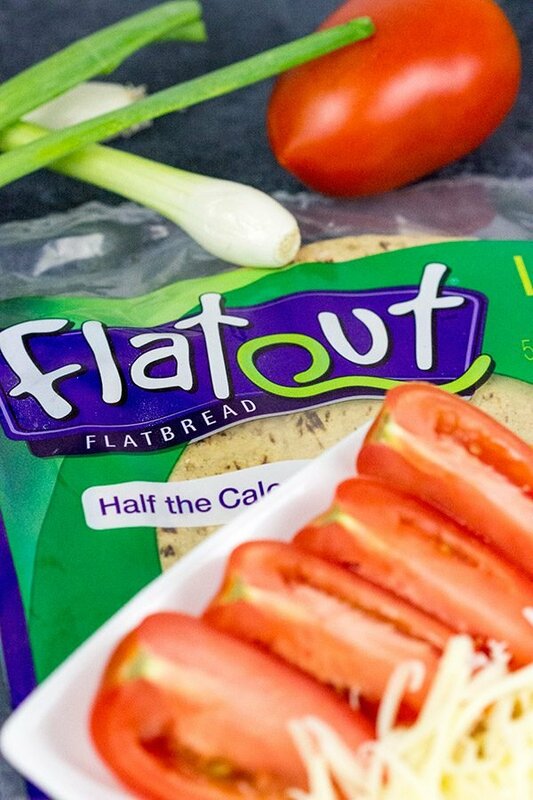 Click here to find Flatout flatbreads near you! And make sure to find a 2-year-old to play piano for you while you eat these wraps. It’s almost like dining out at a nice restaurant while someone plays a piano in the background. Almost! Using a large sauté pan, cook bacon until crispy; pat dry and set aside. Meanwhile, grill or cook chicken breasts until fully cooked; let cool before slicing into ½” strips. 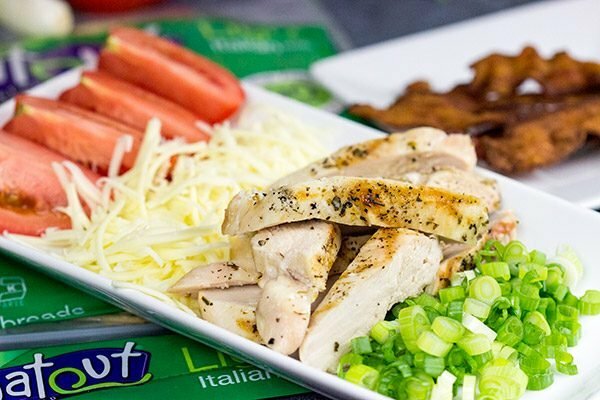 Lay Flatout wraps out and top each with several slices of chicken along with shredded Monterey Jack, green onions, lettuce leaves, tomatoes, bacon and ranch dressing. Fold/Roll wraps tightly. Brush a grill pan with oil and then place over medium-high heat until hot. Place wraps in pan and cook for 2-3 minutes per side, or until slightly crispy. Remove from heat, slice and serve. Before grilling, I brushed the chicken breasts with a bit of olive oil and then seasoned 'em with salt, pepper and dried oregano. But you could go any direction using your favorite spices here! Disclosure: This Crispy Chicken Bacon Ranch Wraps post was sponsored by Flatout Flatbread, but the recipe and opinions are entirely my own. Thank you for supporting the brands that support Spiced! Awwww, Robbie is such a sweetheart to put on a show while you eat :). My cousin’s son loved his toy piano as a little guy and now he plays several instruments and is realllllllly good! I have a feeling Robbie will follow in his footsteps. As for Kermit–I had not heard that news! But I had a good giggle thinking of someone paying his dues as Rizzo before hitting it big as Kermit, haha! These wraps look fantastic; why are wraps just so good? Hah! Robbie’s piano playing during a meal is almost like going out to a fancy restaurant. 🙂 But, yes, I’m thinking Robbie is destined to follow the path of your cousin’s son. There has to be a musical instrument involved in his future…the only question is which one. Thanks so much, my friend! I hope your Monday was awesome. And I hope you didn’t look straight at the sun! Hi David. I don’t know about you, but my appetite (as well as my energy) decreases significantly when it’s hot. So these are perfect, they make a quick and lighter meal. Plus, I’ll bet they are pretty good leftover. Oh, my appetite definitely decreases during the hot summer months, too…well, to some extent. I swear I’m always hungry. Either that, or I just really like to eat. haha! But, yes, I’m with ya, Dorothy. 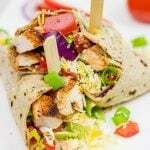 These wraps do indeed make a great lunch, and it’s fun to mix it up a bit. Laura saw these posted yesterday, and she immediately wanted me to make another batch. 🙂 Hope you guys had fun with the eclipse yesterday. I was thinking about y’all! I can’t believe he is fired! Who on earth will do his voice now? And Robbie sounds like he really has a passion for music and that is so awesome! Can’t wait to try out those wraps! OK OK, so you post another wrap and I can’t hide the fact that ever since I told you I hated wraps I’ve been enjoying them more than ever recently. I think the issues was all the wraps I had before lacked flavor and pizzaz. But you got me out of my wrap rut David 🙂 I really appreciate that. OMG, I didn’t know Kermit the Frog was fired. I always wanted to do voice-overs, I think it’s a fun job, lots of reading, lots of talking, two things I do really well. Robbie is so musical it’s fun to hear about his little shenanigans. You should get him into some early music lessons. I excelled at the piano, they said I was a natural. Haha! I totally thought about you when I posted these wraps, Mary. I remember you saying that wraps aren’t your thing. But wraps are just a vessel for all sorts of amazing fillings! (I get it, though…wraps can be really boring without tasty fillings!) I’ve gotta say that “toasting” the wraps a bit in a skillet until they were crunchy on both sides is our new favorite thing. We’ve been toasting all sorts of wraps on the weekends here…just for fun! As far as Robbie and music lessons, it’s definitely on our radar for when he gets a little older! That and dance lessons. We actually looked up a dance studio near us, but we decided to wait until he’s a little bit older before we sign him up. But it’s coming… 🙂 Thanks so much, Mary! I’m still hoping Robbie will become a lavender farmer (Because someone needs to provide me with all lavender, right?). However, career in the music industry does sounds good as well. Let’s the kid decide 🙂 These wraps look delicious, David (No wonder – you’re the king of all kind of wraps). Hahaha! But here’s the thing, Ben. The world only really needs one lavender farmer. (We all know you consume about half of the world’s lavender by yourself, though. Haha!) I will nevertheless present it as an option to him. I mean he does love smelling the flowers outside in the yard…and I bet a lavender farm would smell amazing! 🙂 As far as wraps, these are one of our favorites! Toasting the outside in a skillet added a whole new level of fun. Thanks so much, my friend! The wraps sound so flavorful David, definitely looks like a great choice for quick lunch! Looks yummy! Can not wait to try one! I am gonna make it for tomorrow lunch. Thanks for sharing! Thank you so much, Grace! I’ve gotta say these wraps really turned out well. 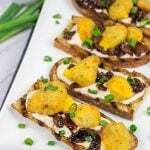 They are packed with flavor and toasting the wraps in the skillet before serving them added a whole new layer of fun. Give ’em a shot! Thanks so much for stopping by and commenting! Robbie sounds like he has some great moves. My grandchildren love to dance too. Whenever they come over they always ask for a dance party, so we put on music and we all dance… so much fun. I would trade in my sandwich for one of these wraps like right now. I would love to take on of these wraps for lunch at work. And as far as these wraps, they are delicious! I love ‘toasting’ the outside of the wraps in the skillet to add another layer of crunch. I also bet these would pack really well for lunch at work…just save the dressing for right before you eat ’em. 🙂 Thanks so much, Dawn! Great food and good music too whilst dining? I’m there! Now, bacon, chicken, lettuce, tomatoes and then cheese to? An awesome combination to fill your healthy wraps with if you ask me! I am a fan of chicken wraps and yours look insanely delicious. On the other note, I also enjoy music in the background when I am alone and cooking. Good that Robbie keeps you and himself entertained with music. Why thank you very much, Balvinder! Try toasting the wraps in a skillet next time…it adds a whole new layer of fun. 🙂 Also, I do enjoy having music on while I’m in the kitchen…but I usually opt for classic rock or 80’s. But then again Robbie has to learn somehow, right? Haha! Thanks so much, my friend! Are you saying he’s improvising at two pianos? I think you may have a genius on your hands. Strange coincidence, but I have some Flatout in the kitchen, and probably have all the ingredients to make these wraps! I had in mind something more burrito-like, but you may have just changed my mind. I love that Robbie breaks into dance mode whenever music comes on! Sign of a happy kid I think. And these wraps of yours look delicious – like every bite would be different and delicious. Perfect picnic fare for this last little bit of summer. You and me both, Marissa! And if I recall correctly, Bart is voiced by a woman and I always thought that was awesome. It’s crazy how people can voice cartoons like that! As a kid, I always wanted to be the voice of Scooby Doo. Haha! I think you need to get Robbie a drum set! 🙂 Then all the neighbors can enjoy his music too! I love wraps, especially when I have to pack my lunch. They hold up so well and are easy to eat! These look scrumptious! Well funny that you mention drums, Kathy, as I did get Robbie a toy drum a week or two ago. It’s not a full-out drum set (although they did have those at the store), but it’s just a little toy drum. He loves playing with the drumsticks, and the noise isn’t all that bad. Haha! So if you get a chance, try toasting your wraps in a skillet. It changes the whole profile, and they become even more awesome! (I know you have to be at home to do that…but still. Try it!) Thanks so much, my friend. I hope you had an awesome weekend! David – you are the wrap king – these sound absolutely delicious – and seeing they are super portable, I need one of these in my non-driving hand when I go to pick Lil Shashi up from college today! And thank you for the kind words about these wraps. Toasting them in a skillet totally changed them into something even more awesome! Try toasting your wraps next time you make ’em. And Happy Monday, Shashi! These wraps seem like a dish I have to prepare soon, David! Great job! For sure, Agness! Toasting the wraps was such a fun little twist at the end, and we loved eating these wraps for lunches on the weekends. 🙂 Speaking of weekends, I hope you had a great one! What is America coming to? Who fires Kermit? Who fires a frog? I need to make a wrap and then give this some deep thought. All I can say is look out Miss Piggy! With your attitude, you could be next! Hey Barbara! I couldn’t agree more. I mean fire a frog? What the heck!? I also agree that some deep thinking is in order here. And deep thinking always goes better when accompanied by yummy food! 🙂 Thanks so much for stopping by and commenting! !